Picking a #1 best carry on bag is tough thing to do. They each have their benefits and faults. But when it comes to value, there is an absolute overall winner. This is our TravelPro Maxlite 4 spinner review. 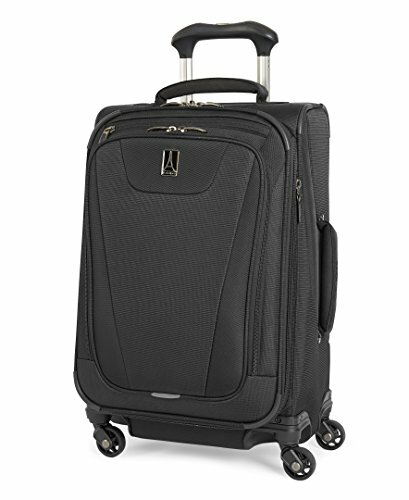 The TravelPro Maxlite 4 carry on spinner is a rare gem that combines great features, quality craftsmanship and an excellent price. Its hard not to recommend this bag considering the value proposition it makes. Sure, the TravelPro Maxlite 4 is very good quality. It has great sturdy hardware, is nice and slim where it counts and has great interior capacity. But the real star of the show here is the crazy value that the Maxlite 4 provides. At under $100 (on sale) this bag is literally 5x less money than the bags it competes with. And to be honest, you’re not missing much if you opt to go for the Maxlite 4. If value is your number one priority, look no further than the TravelPro Maxlite 4 carry on. The Maxlite 4 has bumps in all the right places and nowhere you don’t want them. That is to say that the bag stays nice and flat in order to adhere to carry on restrictions, but also boasts adequate space-saving pockets. The soft-side design of the bag allows for a little expansion but also can help you when you need to squeeze the bag into an overhead bin. The bag is also very lightweight due to its softside design and strict simple design which foregoes many of the weighty bells and whistles of other bags. The exterior pockets is perfect for a reasonably sized laptop and the main internal compartment was surprisingly roomy. The whole bag is also expandable thanks to the zipper running around the exterior of the bag. So if you need that extra little bit of space it is there for you in a pinch (just make sure you don’t exceed carry on size restrictions!) The inside of the bag features two nice quality mesh pockets and compression straps to keep everything organized. Nothing fancy, but for the money this is a pretty decked out bag. The soft side of the bag isn’t the absolute most durable bag in the business, but it certainly gets the job done. In our tests both the spinner and two-wheel “Rollaboard” version of this bag performed well on both smooth surfaces and more bumpy ones (cobblestones in our case). The wheels are solidly attached and seem to be able to take a good beating without cracking or otherwise malfunctioning. Gel padding on the side and top pull handle are a great addition for those of us that are constantly stowing and un-stowing our carry-on bags. The TravelPro Maxlite 4 is featured in our list of the best luggage for international travel. All of the carry on bags on this list are the best of the best. Travelpro has arguably made the best bang for buck carry-on bag with the Maxlite 4 spinner. It is light, durable and hits the mark on all of the main features that we expect from a modern piece of carry on luggage. The bag features TravelPro’s limited lifetime warranty if any issues ever arise. Should I buy this bag? Absolutely. If you are looking for a great bag but don’t want to break the bank, this is the bag for you. For a step up, we recommend the Eagle Creek Tarmac AWD or the Briggs & Riley Baseline Domestic Carry On. This bag is also part of a full line of bags from TravelPro. So you can buy a non-spinner carry on version or even larger full-size luggage in this same line. Dimensions: L9" x W14" x H21"
© 2017 Carryon Guru. All rights reserved.